Before the 1900s, favorite recipes of family and friends were recorded in a manuscript cook book, usually recipes that needed proportions such as fancy desserts. 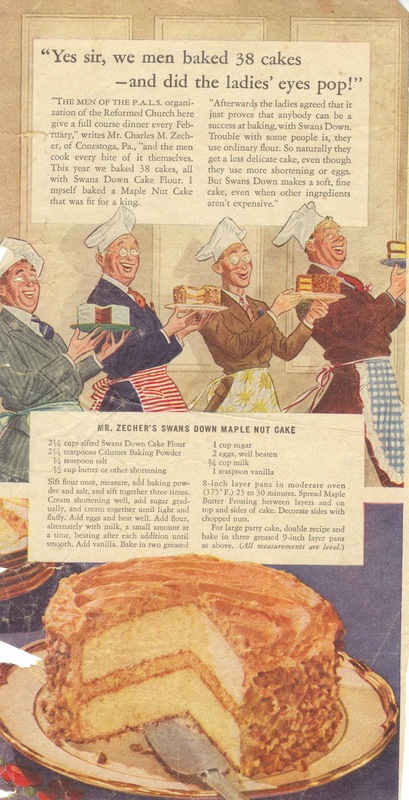 In the 1930s, home economists developed recipes for new super market products for use with new gas and electric ranges. In a journal labeled Cooking Receipts – Mrs. C.B. Fry – 1932 Mrs. Fry filed print and picture recipes from magazines, newspapers, and food labels. The manuscript is now owned by her granddaughter, Brenda Fry Coffey of Kure Beach. Mrs. C. B. Fry (Ada Sessoms Fry), alias Ma Fry, came to Kure Beach in 1943 with husband Pa Fry (Charles Brover Fry), their son (Therman J. Fry), his wife (Mary Lee Tyler Fry), and granddaughter (Brenda Lee Fry). Ma Fry and her daughter were wonderful cooks for “Fundy’s”, their family restaurant in Kure Beach after World War II. 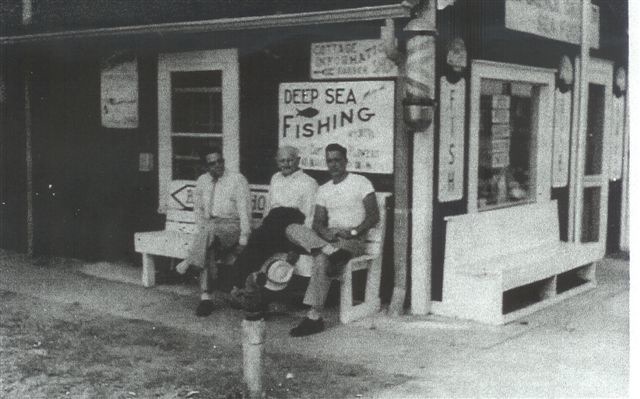 Mrs.
Fry was the secretary of the Progressive Association which applied for official town status of Kure Beach in 1946 and granted in 1947. She also rode on the first Kure Beach Float in Wilmington’s first Azalea Parade. The float depicted a fishing scene with adults and children fishing. Large plastic fish dangled from fishing lines. 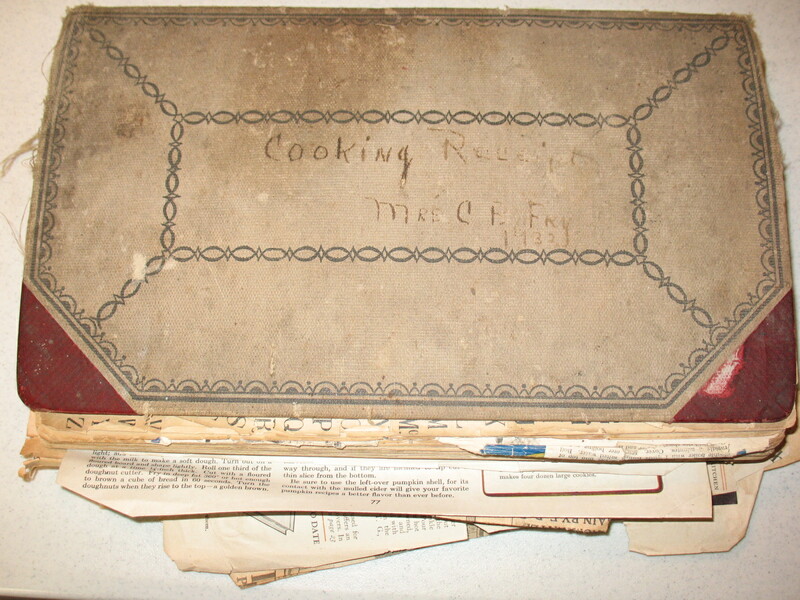 Mrs. Fry’s recipe collection provides a look back in history. 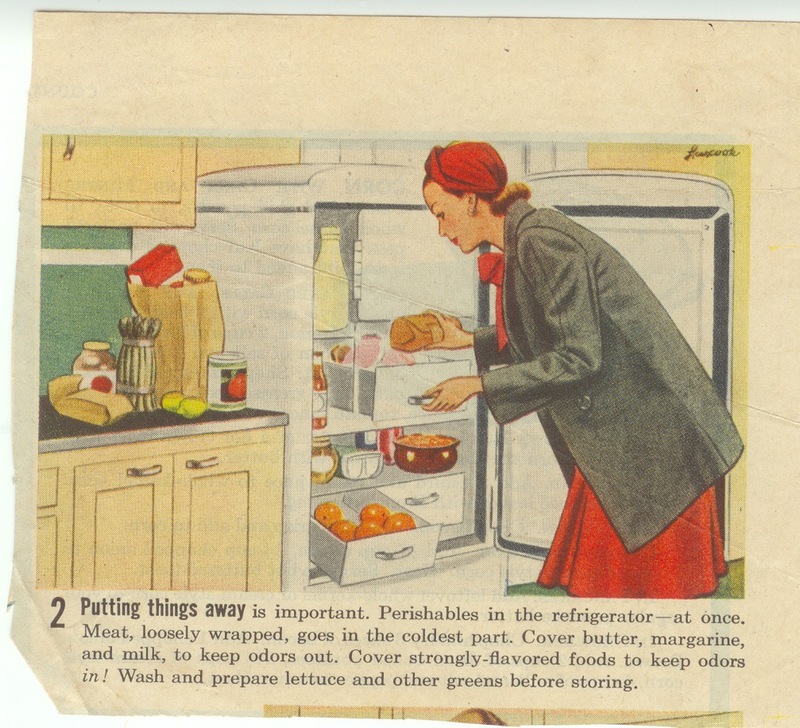 Home economists were teaching homemakers how to care for the electric refrigerator which could now store ice cream in limited amounts. 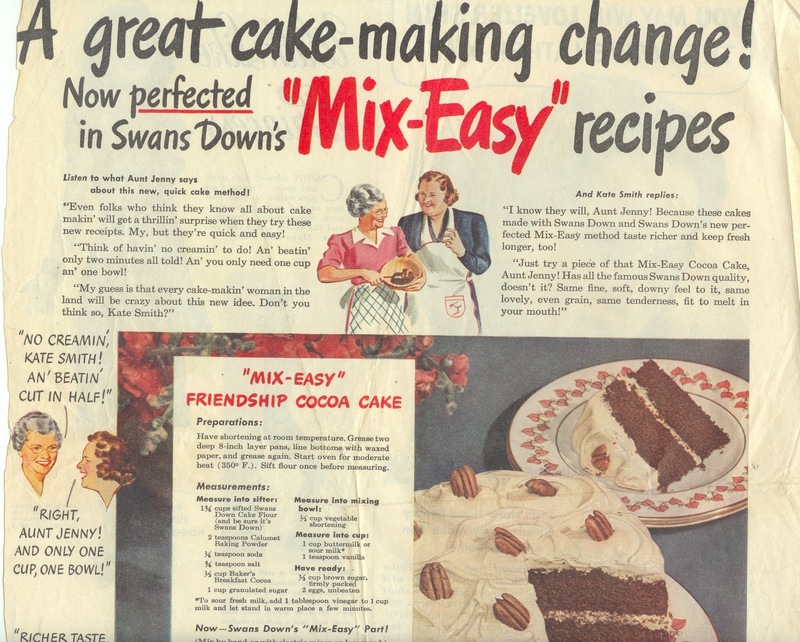 Many of the recipes of the 30s continued to promote use of cream, butter, and gelatin. Favorite recipes in Mrs. Fry’s collection were baked calf’s heart and jellied tongue. Many of the printed recipes in Ma Fry’s book were advertised as developed and tested by – food scientists in government – Dr. Louis Stanley, Bureau of Home Economics, USDA. 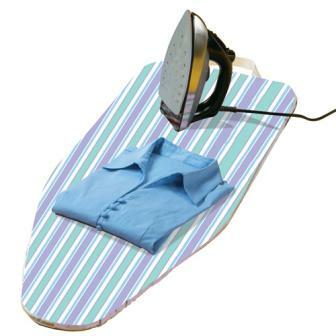 – home economists working for General Foods Inc, Better Homes and Gardens, and the Good Housekeeping Institute. – columnist -Mrs. S. R. Dull, Atlanta; Housewives’ Exchange: The Charlotte Observer. – home economists in food companies- Libby, McNeill, & Libby, Heinz, Minute Tapioca, Knox Sparkling Gelatin, Jello, Crisco, Eagle Brand Sweetened Condensed Milk, Baker’s Best Chocolate, Coconut; California Prunes, Swift’s Premium Ham, Red Label Karo, Eatmoor Cranberries, Calumet Baking Powder, Swan’s Down Cake Flour, and Washborn Crosby Gold Medal Flour, the latter promoted by Kate Smith and Aunt Jenny. Clipped recipes were kept in kitchen drawers, recipe files, and indexes as advertised in 1933 by Better Homes and Gardens. 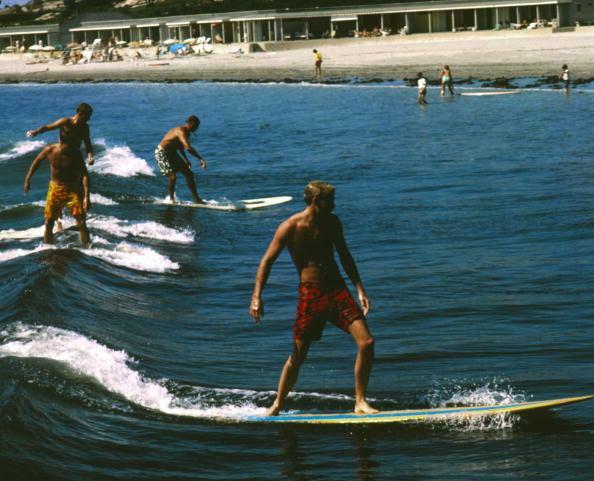 This was before the days of television. – recipes with high sugar syrups canned fruits. Most recipes were made from scratch except for a few canned goods available on the market. Canned foods advertised in newspaper clippings in Mrs. Fry’s book were tomatoes, pork ‘n beans, cream soups, canned milk, baby food, and condiments such as Worcestershire Sauce, ketchup, mustard, hot sauces, mayonnaise, and vinegar. Cooking fats were Crisco, lard, and butter. Margarine was mixed in a clear plastic bag. Kids fought over who popped the bubble to blend the yellow color into the white margarine. 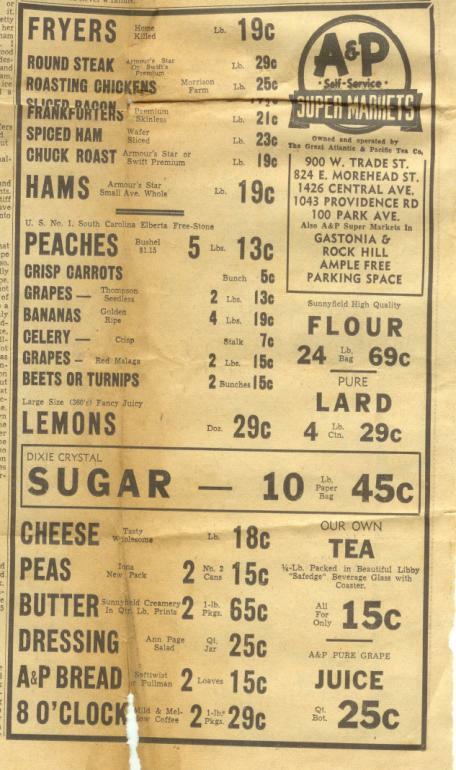 Foods advertised in Ma Fry’s recipe clippings from the 1930s to the 50s were Instant Potatoes, Cheese Whiz, Kraft Singles, Reddi – Whip, Dannon Yogurt, Frozen French Fries, TV Dinners, and Instant Rice. Pizza was not yet a household item. 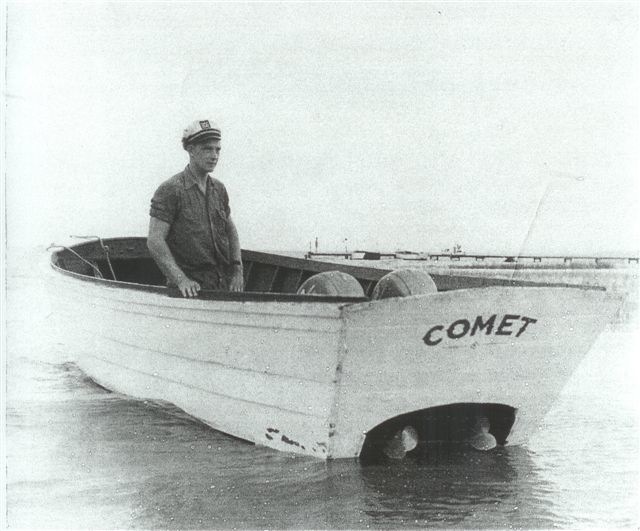 Fast Food of the 1950s were not yet on the Island. Ma Fry’s recipe clippings from The Charlotte Observer (ca 1939) included a column -Teach Children To Cook. It was written by a Charlotte Housewife for little girls with the “urge to cook.” Two-year-olds learned to make fancy pies and cakes in the sand box. Lessons suggested helping mother stir custards, prick holes in the piecrust, and make food for parties and grandparents. Recipes provided for children were Jellied Waldorf Salad, Pineapple Chiffon Pie, Pig in Blankets, Brochette of Bacon and Sweetbreads, Creamed Onions and Bacon, Kidney and Bacon Grill, Frozen Tomato Cottage Cheese Salad, Crisp Bran Cookies, Scrambled Dried Beef with Bacon. A column on a Teen-Age Kitchen Party suggested teens cook their party foods: frankfurters, Chili-con-carne, and pork sausage patties. The Charlotte News Grocery Editor, Florence Thomas, featured ideas for Tea and Picnic Sandwiches – rolled, checkerboard, and ribbon shapes for the attractive tea table. Mrs. Fry’s collection included the following recipes. Any look familiar? Straight from her recipe collection of 50 or 60 years ago, they are still delicious today. Fry small oysters in a little fat for 3 minutes. Add a little cream and heat thoroughly. This is delicious with any broiled or baked white fish. Parboil frankfurters, drain and cool. Roll baking-powder biscuit dough out thin, cut it into squares and roll one frankfurter in each. Bake 15 minutes in hot oven – 375 – 400 o. The dough may be spread with mustard before rolling up. Wash lettuce and cut in pieces. Cook salt pork in a heavy skillet until brown and very crisp, remove from the fat. Add the lettuce to the hot fat and sir until it wilts. Add the vinegar and cooked salt pork. The time of cooking will very with the time to wilt the lettuce. A small quantity of onion juice may be added. Drop by spoonfuls on a well-buttered pan about an inch apart. Bake in a moderate oven (350o) until a delicate brown about 10 minutes. The ingredients are 2 cups of molasses, 3 tablespoons butter, 2-3 cup of sugar, and 1 tablespoon of vinegar. First, melt butter, than add molasses and sugar, stirring until sugar is dissolved. Boil over slow fire until brittle when tried in cold water. If you use a confectioner’s thermometer, it should register about 255 o. Just before removing from fire, add vinegar, which will make the candy foam up. Pour into well-buttered pans. When the candy is cool enough to handle, you may pull until it turns light colored. Draw into sticks and cut into inch lengths. If you wish, molasses nut candy, add 1 cup of chopped nut meats and a pinch of salt, just before taking candy from stove. Place the cake crumbs in the bottom of a pudding dish and moisten with the sherry. Cover with a layer of whipped cream. Add a layer of the sliced bananas and strawberry jam. Cover with whipped cream and sprinkle the top with the chopped walnuts. Refrigerate for several hours and serve. Line the bottom of a well greased baking dish with banana slices. Dot with bits of butter, sprinkle with lemon juice, and cover with fine bread crumbs. Repeat the process. Mix milk and water, add lemon rind and scald. Combine the slightly beaten eggs, sugar, and salt. Pour the hot milk over the egg mixture, add vanilla and pour over bananas. Set dish in a pan of hot water and bake in a moderate oven (350o) until set – about 30 minutes.